Charles M. Sheldon (1857-1946) served as minister of the Central Congregational Church in Topeka, Kansas from 1889 to 1920. He was also an author of the international best seller, In His Steps, which was published in 1897. A series of correspondence, presented here, is arranged in chronological order. A complete description of the entire collection is available through a link below. The correspondence consists of letters, postcards, cards, one notebook containing letters and newspaper clippings, and assorted personal items such as his self-portrait drawings. 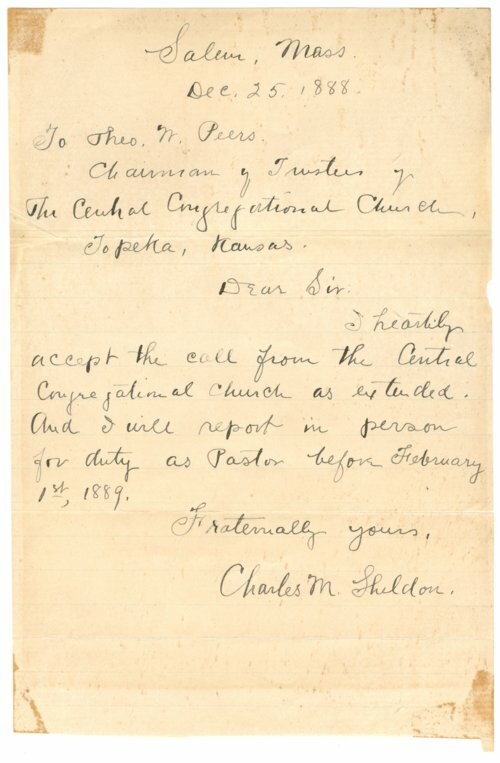 The majority of the correspondence consists of handwritten and typed letters to and from individuals, members or groups related to the Central Congregational Church, and organizations associated with his lifelong activities as a pastor and author, including Theo Peers, Ethel Peers, Anna Heartburg, Dorothy Heartburg, Helen T. Capps, Lida R. Hardy, May Flickinger, Charles Warren Helsley, Luther D. Whittemore, Hamilton Holt, Robert Thomson Jr., Norman J. Rimes, Lloyd George, James Wise, Arthur Capper, Michael I. Pupin, Alf M. Landon, Roy B. Guild, Arthur E. Hertzler, Samuel J. Crumbine, Wilbert E. Dull, M. de Arrude Camargo, Frank J. Warren, Beatrice Hoover, Samuel C. Spalding, H. T. Chase, Bishop Wise, The Emporia Gazette, Green Gables (the Dr. Benjamin F. Bailey Sanatorium), The Atlantic Monthly, The World's Christian Endeavor Union, Plymouth Congregational Church, University of Illinois at Urbana Department of Physics, Abraham S. Hoyo, Harry Emerson Fosdick, International College in Turkey, Federal Council of the Churches of Christ in America, Rollins College in Florida, The Topeka City Commission, Students' Christian Association of South Africa, Crosset & Dunlap Inc. Publishers in New York, Christian Herald Association, The Texas Herald, The Henry F. Henrichs Publications, Frankfort Rotary Club, and Notre-Dame de France/Jerusalem. There are letters involving other individuals, including Charles W. Helsley, Emma Crabb, H. J. Colburn, Robert Stone, Arthur G. Sellen, Henry F. Henrichs, Logan Shoop, Frank Jacobs, Hugh F. Mckean, Lee Braxton, Cady Hodge, Charles S. Lawrence, Elizabeth Turner Rawlings, Elisabeth Ebright, R. L. McNatt, Gale L. Beck, John H. Lehman, Helen Bradford, and Everett R. Daves. Charles W. Helsley was a minister at the Central Congregational Church after the passing of Charles M. Sheldon, and Emma Crabb was in charge of the Sheldon Collection at the Central Congregational Church.